I read widely and compulsively and my fancies are ever changing. My love of reading, however, is no mere fancy. Full Disclosure: I received an advanced reader's copy of this book in exchange for a review. 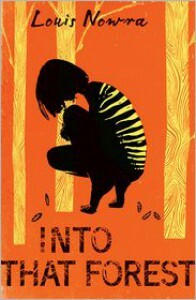 Set in Tasmania some time in the past, Into That Forest is a deliciously subtle young adult novel about two young girls, Becky and Hannah, who get lost in the bush after a terrible accident kills Hannah's parents. They are taken in by two Tasmanian tigers and live with them for four years. The girls lose language and the ability to interact naturally with other humans but gain a deeper, primal understanding of their environment, learn to hunt, to identify animals by scent and to survive in the wild. This was a very brave and daring novel for young readers, rich with subtext and allusion, that benefited, unexpectedly, from a close reading. A lesser author could have botched the complexity of the relationship between the two young women and their tiger-parents, or stumbled over the effects of coming of age in such a primal environment, and the subtlety with which these two were handled made for an engrossing read. Highly recommended.